Physical Dramaturgy A (New) Trend? Dramaturgy in contemporary dance is a hot topic, in a positive sense. It is about involvement in the creation of a work, that is to say about authorship and collaboration, exchange and criticism, ideas and concepts, visions and their application, research, development processes, work on structures and forms. Ideally, when preparing a piece, dramaturges are the choreographers’ best friends. “Thinking together, researching together and designing together“ (Hermann Beil) in what is a “complex field of activity”, particularly in contemporary dance, has developed into a “critical and discursive practice” (Susanne Traub). There are many methods that focus on particular aspects, but multi-disciplinary dramaturgy concepts are rare. That is why a term like physical dramaturgy is striking. German choreographer Martin Nachbar and Belgian writer Jeroen Peeters use this label to describe how dramaturgy can work differently. At a workshop at the Inter-University Centre for Dance Berlin (HZT) during the Tanz im August festival back in 2006, Nachbar and Peeters made a presentation entitled Backtracking on what they had learned about dramaturgy through their cooperation. More workshops followed, for example at the International Dance Festival ImPulsTanz in Vienna in 2009, Workspace Brussels in 2011 and the Institute for Applied Theatre Studies at the University of Giessen in 2012. In November 2014, the International Dance Artist Service at tanzhaus nrw in Düsseldorf staged a three-day seminar entitled Physical Dramaturgy, at which presenters including Martin Nachbar, Sandra Noeth and Manolis Tsipos opened up this field of enquiry. 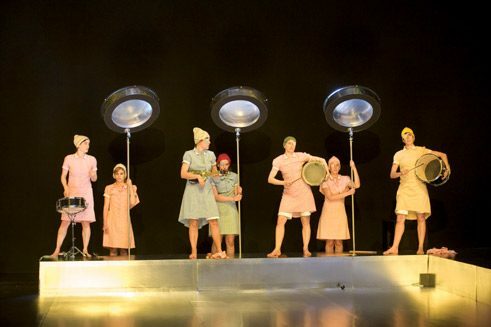 Peeters’ and Nachbar’s declared aim is to communicate how physical dramaturgy attempts to examine and fully explore the space of meaning opened up by moving bodies, and also the different materials and ideas that “populate” a creative process. The specific objective is to stimulate an awareness of basic structures and contexts of artistic work. Another principle is that “theory and practice, research and the creative process, movement and reflection are to be seen as overlapping activities“. As stated in the advertisements for the workshop, the aim is to enable “a place of discourse” to be created “where a critical awareness of time, space perception and the generation of meaning” can emerge. The author makes a precise statement concerning the subject of reading: “Exercises we do address literary and theoretical texts on three different levels: first a reading of the text’s argument or narrative (if needed with clarification of terms and of the discursive context); second a literal reading: a focus on the language used, especially the spatial and corporeal metaphors; and third: a physical reading, which takes the literal reading onto the dance floor.“ Thus, the clarity physical dramaturgy aims to achieve results from in-depth reading of philosophical and literary texts. The freedom of this set of methods, on the other hand, arises from heterogeneity in dealing with the material. While insisting “that material also has a right in itself“, Peeters also postulates: “Material stands in opposition to the notion of the ‘ideal piece’, the spectre of a material-blind dramaturgy that is obsessed with projecting meaning from an outsider’s ideal viewing position.“ And also apparently “unnecessary“ materials that find their way into a work are assigned a meaning that emerges from the specific qualities of the artistic process. That is evident in Meg Stuart’s It’s not funny (2006), for example, or in Jennifer Lacey’s Les assistantes (2008). Peeters gives an example to illustrate the function of a text in dramaturgic practice. In his cooperation with Nachbar on his piece Repeater about his father (2007), Peeters suggested using a paragraph from Don DeLillo’s novel White Noise as a “dramaturgic map“: “A kind of readymade to which we could relate most of the other materials we had gathered or developed.“ This succeeded because it was a piece of text on a father-son relationship which could be related to the father-son relationship in the work. To sum up, then, it may be said that physical dramaturgy offers a method of dealing with the increasingly complex web of interconnections within which the authors of a choreographic work today have to get their bearings. This is a method that is logical, also in terms of its research potential, that opens up plenty of space within its “conceptual landscape” for artistic decisions at every aesthetic level and that calls for a “depth-first search“ in material. Herein lies the political aspect of physical dramaturgy. Artists are directly encouraged to carry out basic research and organisations that decide on financing and production conditions are indirectly called upon to allow this to happen. It remains to be seen whether the attention paid to this suggestion so far marks the start of a new trend. Helmut Ploebst is dance critic at the Viennese daily “Der Standard”, founder and editorial spokesperson of the “CORPUS Internet Magazine for Dance, Choreography, Performance” (www.corpusweb.net).